Whether it's Compton, Brooklyn or a neighborhood near you - Ameena Matthews' message of Violence Interruption is relevant. Cease Fire in Inglewood, Illinois on the Chicago streets is administering the truth, to counteract gang violence. Ameena Matthews and other members of Cease Fire speak directly to gang members. Describing the "world as is" and contrasting it to the "world as it should be." Not preaching but delivering a message from experience, hurt and a desire for saving lives. Revive Black History Month with the Cease Fire program, a credible group of well-respected urban personalities - approaching gang members with heart, valor and thoughtful actions. Watch how Ameena approach, internalize the crowd and deliver a message holding this audience to accountability. Encouraging young men and women to create a community safe space. 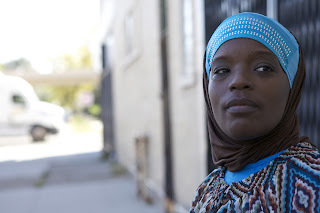 Ameena Matthews of the Cease Fire organization are Violence Interrupters. They are leading by example with care and honor; re-iterating a disease of violence in urban Chicago. Encourage the Youth and inspire change. Cease Fire and Ameena Matthews are disruptive, using their leadership going where no one desire to walk; we need more of you. "Every Thursday" will feature people of creativity and/or ideas of leadership throughout their work. Engage your community with profound insight and intelligence, and next Thursday it might be you. May Allaah Ta'alaa guide her, protect her and grant her success in reaching the hearts and minds of our young brothers and sisters who have sought refuge in gang life. Woooow. MashaAllah!! Been keeping up with the blogversation on my phone. Thank you, brother. May Allah continue to bless you with the knowledge and talent to keep us informed! Ameen. And I will be tuning into PBS tomorrow night where the sister Ameena will be featured on a series called "frontline"
Amin Muslim Mommy and Thank you for supporting Create-A-Voice. Directed by Steve James ("Hoop Dreams"), "The Interrupters" profiles three Chicago activists working to end gang violence. The three work with CeaseFire, an organization that utilizes a public-health approach in order to stop violence before it occurs.